Presently D.J. Young is a full-time writer, mentor and conference speaker with a passion for encouraging men in their God-given role as Dad. He has authored multiple books under Wisdom4Dads ministry. He and his wife Kathy have been married over 45 years and are the parents of five adult children and grandparents of eight. D.J. Young grew up in Aberdeen, South Dakota, the fourth son of local parents and a twin. He believed at the age of 13 he was called to become a priest. After serving three years in the U.S. Navy in Japan, he attended seminary in Joplin, Missouri and Godfrey, Illinois but, subsequent to an encounter with Jesus and the Holy Spirit, he was asked to leave just before taking his final vows. Realizing he needed to seek further advice, he returned to Aberdeen and sought out secular counseling. At the same time DJ met a Montana girl who attended school with his sister. Kathy and he married and began a family while he received a Bachelor of Science in Sociology and then performed graduate studies in Special Education. Throughout their young married and parenting stage of marriage, D.J. and Kathy moved their family to a variety of towns in the Midwest following the leading of the Lord; he held down social working positions as Kathy remained an at-home mom and substitute teacher. In October of 1984 the family of seven u-Hauled it from St Louis to Portland, Oregon, venturing into a city in which they had never set foot. It was after that season of pastoring in Illinois that D.J. became a Christian School and Bible College teacher–for over twenty years. At the same time he and his family hosted thirty international students with varying lengths of stays–from one week to three years—and from various countries–Latvia, Germany, Guatemala, Saudi Arabia, Japan, Switzerland, Indonesia, Hong Kong, South Korea, Taiwan, etc. As a board member of Oregon Christian Writers for ten years, D.J. also created a team of volunteers and directed three successful summer writers’ coaching conferences. D.J. maintains a writing plan because he has a list of more books to write, but one of his greatest joys is to encourage men who may be in a time of personal, spiritual crisis. He provides personalized communication (usually over the phone) as each man, husband, and dad continues to walk with the Lord. In his retirement he still actively shares various home improvement projects with his sons and son-in-law but yard work routinely keeps his physical activity at a vibrant, healthy level while maintaining a rigorous writing schedule, occasionally engaging in a speaking event. Each of his writing projects is a masterpiece of theme-based Bible studying with the addition of well thought out questions of practical applications in every man’s life. 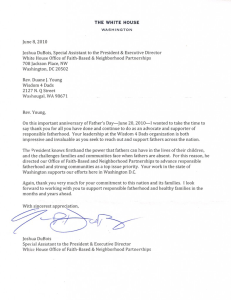 In conjunction with the 100th anniversary of Father’s Day this Sunday, June 20, 2010, the White House sent a special letter of thanks and commendation to D. J. Young, founder of www.Wisdom4Dads.com and author of 10 books on fathering. 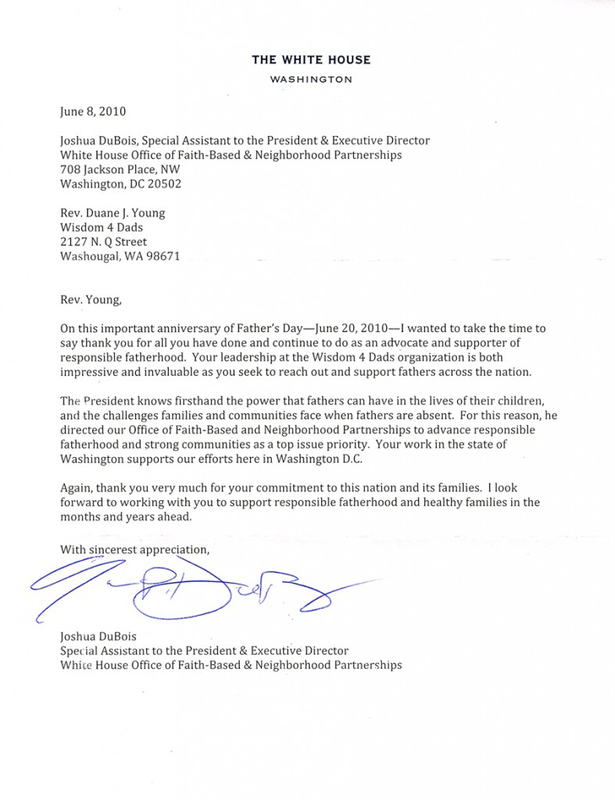 The letter from Joshua DuBois, Special Assistant to the President – and Executive Director of the White House Office of Faith-Based and Neighborhood Partnerships is below.